My life has always been surrounded by dogs. 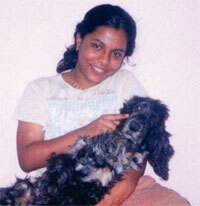 My first partner in crime was a beautiful Cocker Spaniel named Tipsy, who entered my life when I was four years old. It was always comforting to know that after a long and tiring day at school, someone would be waiting for me at home. Even though I was too young to realize it, but in retrospect, I have realized that dogs are the most beautiful friends to have; their unconditional love is not bound with expectations in return. There are numerous memories of my childhood spent with her, playing football with her on the terrace, taking her for long walks and the car rides that she always looked forward to. I cannot forget the look in her eyes when I was angry with her. It made me revoke all the feelings of anger, and within moments, we would be playing once again. We all know that everyone ages with time, so did Tipsy. Her youthful charm got snatched away when the doctors detected that she had a kidney failure. Those last few trips to the veterinary surgeon’s, the painful blur of syringes and the desperate measures taken to hold on to Tipsy, indeed taught me a lot about life. There I saw, the limp and almost lifeless body of my dear friend, who I could not help anymore.The ten years of her companionship came to an end with one life-changing decision. It was too hard to watch her suffer. She slipped into coma a day before she died. As I called out her name, she just stared into vain, unaware of everything happening around her. It was hard thereafter, to come back home and not find her waiting for me. Sometimes I’d enter the house calling out her name, forgetting that she’s not going to respond to all my calls. This experience taught me something that human beings never could. The end always comes, but life has to move on. The only way to deal with losses is to remember the good times. There are countless memories of her that will keep me smiling for a lifetime. It has been five years since she passed away. 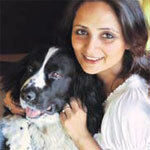 My family has increased three-fold, with the inclusion of another Cocker Spaniel, also named Tipsy, and her kids, Kajol and Nepu. My life is complete once again, and I have learned the virtue of loving unconditionally from my experiences with them. Sometimes people ask me how I managed to move on. It’s simple, those cherished memories of Tipsy are relived every time I enter my room, greeted by my dogs, the background provided by my room’s wall, with Tipsy’s portrait and her last collar. If she could speak, would she complain? Her eyes capture my heart. She knows I am drawn to her innocence. She follows me like a shadow, as though beyond me there is no existence for her. My heart cries, when I have to go away from her. Her affection is worth melting for and her loyalty is undiverted. 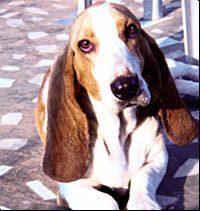 She is Fawn – the Basset Hound in my life. The more I look at her, I am convinced about the magic animals bring in our lives. The feeling is unconditional that they share, is that not something human beings should adapt more. Her boundless steps that follow me day and night help me reflect more in life. The brooding eyes and sweeping ears always convince me that my day/life cannot be that bad cause someone has had a worse day than me. The highs in her life are during her meals and when I come towards her…with that how can I not feel important? Her playtime with the bone and rug dodges my childhood and gives me the young rush. Her words are her actions, her tail wagging, that peck, the jump in excitement, the cuddle and others that we often fail to even acknowledge. I often wonder if she could speak what would she tell me? Would she advice me back on all times I have spent sitting with her and talking about any problem I have had? But at this moment, she has her one paw on my lap, eyes gazing at me in deep thought, a silent listener whose attention cannot be taken away. In all, she is the epitome of understanding, loyalty and adoration. Can anyone ask for more than this? She represents the most warming character of the paw world. It’s not the worldly riches, success, career that completes human accomplishment; it is the difference they have made in the life of any animal. They speak in action, so the best understanding you can show is care for that heart beat! http://www.dogsandpupsmagazine.com/wp-content/uploads/2007/11/pawtails11.jpg 107 200 Dogs and pups Magazine http://www.dogsandpupsmagazine.com/wp-content/uploads/2017/05/1254nal.jpg Dogs and pups Magazine2007-11-14 00:00:002013-11-09 16:37:04Magical love... nothing else! For me, perfection is a mix of loyalty, courage and gentleness combined with majestic beauty and rare intelligence – all the qualities we find in the Great Dane. I can never bring myself to call a Great Dane a “pet.” They are loyal friends to whom you are always right. They are willing to endure hunger and discomfort if they can just stay with the ones they love. Fear and loneliness are unknown when you have a Great Dane. It is a great satisfaction to know that your dog is capable and willing to handle any situation and with Great Dane, this satisfaction is guaranteed. I am lucky to have been blessed with Tina, a Great Dane. Alike all Great Danes, Tina was a family dog in a true sense. She was very close to me but was equally generous in her affection to the rest of the family. Her eyes lightened up when she heard my voice and she leaped with joy on seeing me. She was dignified and I loved the way she responded to a greeting. She used to put her head on my lap for petting and raised a paw to shake my hand, a dozen times each day. I can never forget her statuesque beauty and the graceful movement of her powerful body, which was a joy to behold. She was intelligent and I admired her ability to learn quickly and her willingness to please. She responded to my mood and constantly tried to please me. We both shared the perfect understanding between us. Today, Tina is no more with us. It is impossible to find words to express the joy and comfort derived from her companionship. Her eyes expressed the devotion of her love for me. With deep humility and thankfulness, I am happy that I have known the devotion of a Great Dane. May her soul rest in peace! http://www.dogsandpupsmagazine.com/wp-content/uploads/2007/09/re11.jpg 107 200 Dogs and pups Magazine http://www.dogsandpupsmagazine.com/wp-content/uploads/2017/05/1254nal.jpg Dogs and pups Magazine2007-09-20 00:00:002013-11-09 16:48:30Adieu Tina, my love! If the cats can… they would have whispered these words to everyone. The mindset of people is different from one another. Some may love cats, some may be indifferent to them, while a few may be scared or even hate them. Most of the fear and hate, that cats have to face from humans, come from baseless superstitions that associate them with bad luck and evil. Your heart breaks when you witness your beloved ones to be chased, shouted at or abused by somebody. So it is important for the cat lovers to take the responsibility for spreading good things about cats – their love, companionship and cat-human relationship. They are independent but unobtrusive. They should not be discriminated but be loved. As a cat owner, I have realized that when confronted by negative behaviour towards my pets, getting on the defensive does not help. One needs to gently change attitudes and get more people converted into the catfold! I have eight felines and I try and allow as many people, especially children to interact with them. The children learn that if they are gentle and still, the cats come up to them to make friends. Even their mothers treat them with respect and dignity. Sure, love dilutes hatred! Christmas, New Year, gifts and holidays, the year always ends on a happier note. Every New Year brings with it a whole new world for us. Here’s wishing all the readers of Dogs & Pups a VERY HAPPY NEW YEAR. As northern India shivers with winter chill, it’s very heartening to see people giving warmth, love and most important, food to our beloved Pariahs to beat the cold waves. I heard of a family who inspite of their meager income did their best for two little pups who came looking for warmth and shelter. Not only did they feed these furry angels but also provided them with warmth at a cozy corner in their small room to cuddle up with the family. What an amazing gesture! What caught my attention also was that certain people who in order to keep our great Indian Dogs warm have made warm corners for them in the streets or back alleys by giving them old clothing for their bedding and a few lucky pariahs have even got dog coats. Kudos to the spirit of caring and sharing. But the truth is that with a few lucky ones who are being cared for by the communities, still there is a vast majority for whom every second is a challenge and are living against all odds – winter, summer or rain. So let’s all gear up and be more responsible towards our community pets. The second week of February is rather special as along with Valentines Day comes the Random Act Of Kindness Week. Sparkle hopes that you spread love, cheer and kindness not only to your furry angels but also to our pawfect pariahs.